An 8x8 of this pic would be great! Re: Request for Limbo character. Not possible though he's too large to fit in 8*8 in my opinion. At least 8*12 would do it I,think. I dont need the white edge. How could do 8x12 in axe? Just two 8*8 sprites put one above the other. And I know you don't need the edges, but the character is much taller than he is large, and those dimensions are not really possible in 8*8. ^Pretty much what Matref said. If you went up one size, 8x16 would technically be the largest you could utilize. *Edit* Working on an attempt. The art style intrigued me. *Edit 2* Here's a fairly quick attempt. Unfortunately, you loose a lot of detail. 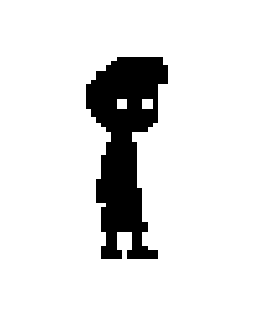 Second sprite double sized for viewability. Page created in 0.526 seconds with 46 queries.